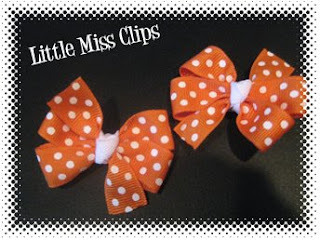 Or brighten up her face with a pair of clips or a popular korker bow. This Korker bow is full and large. Pink Orange & Red. Other colors available. $3 for this Large Korker Bow or purchase a small set for $5. This set is another favorite. Small size $1.75 each or $3 per set. Medium $2.00 each or $3.50 per set. 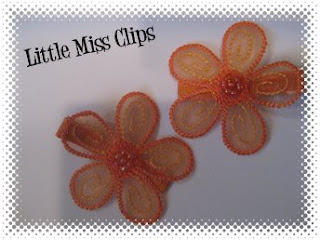 Gorgeous Orange Applique Flower set is $4.00, or $2.25 each. I bought these for my niece and she loved them! This bright tangerine color and darling flower bow is so cute in her blond hair! I love Little Miss designs -they are unique and so sweet.